In which I muse and meander on the strange task that is being a parent, GCSEs and all things connected. Thus, cut to save those of you not interested in such waffle. My son turned fourteen in February. This by itself was alarming enough. In my head, I’ve still only just him. In the darkest, scariest recesses of my thoughts, he’s still that 4lbs 6oz baby lying in an incubator. He really isn’t. He’s now officially taller than I am, with bigger feet. His voice is in the lower registers and he’s taken to walking a couple of paces behind me when we’re out and about. He’s a young man, not a little boy. However, there are traces of the little boy in him still; he likes to grab a hug and we still have our morning ‘where’s my smile, where’s my kiss’ routine. Until the day he denies me access to his bedroom, that’ll remain. Academically of course, what turning fourteen means in real terms is taking his GCSE options. And I’m almost entirely certain it wasn’t this complicated for kids when I did my options a thousand years ago. (I’m old enough to have done O Levels rather than GCSEs, so maybe that’s why the process is so different). Ignore the blue sky. NONE OF THIS INVOLVED BLUE SKY, DAMMIT. The Son had four option paths to choose from. The core subjects are pretty much the same for all – English, Maths, PE and Ethics and Philosophy (E&P is what passes for RE/Social Studies at the Son’s school). He won’t take exams in PE, but it’s nice that they have to do a compulsory class at least once a week. Science is complicated. I’ll explain science in a minute. Path One was a weird choice. Core subjects, plus a language, one option and then an applied GCSE in either Engineering, Art and Design or… the other one I can’t remember. This seemed quite appealing to the Son at first, because he wants to be an engineer. Specifically, his interest is fixed in bionics and robotics. Now he already has a heads-up on me at that age, because I’m still trying to figure out what I want to do when I grow up. So we looked at that choice, only for him to be told not to do it because ‘he was too bright’. A flattering comment, but there we are back at square one. Path Four was never a choice. Path Four, as Son himself put it, is the non-academic route. It’s the courses that take days out at a local college: bricklaying, hairdressing, animal care. So we’re left with Path Two, which is apparently the traditional path and Path Three, which is the Triple Science route. Triple Science is, frankly, a mad thing to put your child through. All three sciences can be taken – but it’s at the cost of doing double languages as well. Triple Science, Double Language and two other options and you have no time to breathe. Nine exam papers for the science component alone. For Son, who wants to do science but not languages, this route has also been passed by. So we’re on Path Two. Dual Science, core subjects, compulsory language (French in his case) and three options. He’s taking History (because he likes it) and then Electronic Products and Resistant Materials (that’s woodwork, metalwork and TD to us old-timers). Dual Science, as I understand it, means they get a GCSE at the end of Year 10 (again – that’s the 4th year to us old-timers) and another at the end of Year 11. If he then wants to go on and study a specific science at ‘A’ level, he has to get a minimum of a ‘B’ grade in his GCSE, with an average of an ‘A’ grade across his chosen subject. When did it get so complicated? 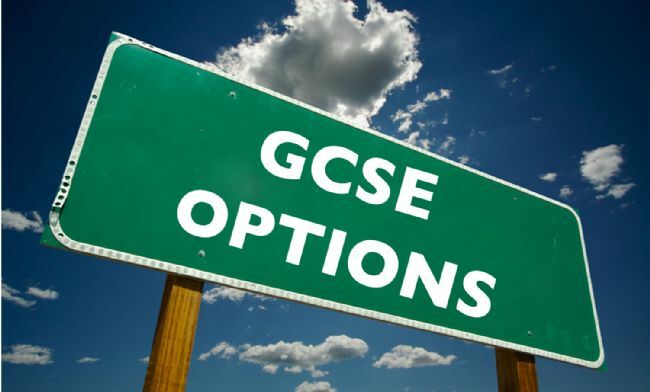 When I took my options (which I made a complete pig’s ear of – 2 of my chosen subjects never got to exam stage due to the teachers leaving halfway through the O Level year and the subjects being cancelled), it was ‘here are your choices. Take five subjects. One must be science. GO!’ Seriously. If the parents don’t have a grip on what’s going on – and the consensus of opinion at the parent’s evening was precisely that – how the heck are the kids meant to make the right choices? This is what I expect to see. Although not left-handed, because then I’ll suspect he’s a changeling. Suspect more, I mean. Son himself seemed to be perfectly happy and content with his choices. He knows that come September, the fun and happy times of doing whatever he liked with minimal homework will draw to a close. For the next two years, it’s head-down studying. As I get older, I increasingly think these things are thrust on kids far too early. How can a fourteen year old, whose hormones are gaily skipping about in all known directions simultaneously have a grip on their future? Unless they really, really know what they want to do in life – and I know they’re out there – how can they be expected to plan that far ahead? Parenting is a hard job. When they’re tiny, you worry about them falling off things, falling over things, falling into things. When they’re bigger, you worry about letting go of their hands in crowded places. And now he’s a young adult, I worry most about his choices. The true art is knowing when to guide and when to steer. For most of the Son’s life, he’s been guided. This is no exception. His dad and I both said to him ‘we will support you with your choices – but you pay us back by working hard’. So yes. Parenting is a hard job. I’ve made it up as I’ve gone along pretty much; not having mum around during the early years and not really having any close female friends or relatives at that time meant that I was largely grasping at straws. But he seems pretty damn decent to me. He’s a nice kid; well-mannered, laid back, pleasant to take out in public, bright and incredibly thoughtful. (Example: for his birthday meal, his dad took out the Son along with three friends and his stepmother. Son insisted that me and The Husband came along as well. Fortunately, we all get along really well, so it was nice – but highlights just how thoughtful he is). People comment on how pleasant he is all the time. We’ve done something right – and I’m justly proud. He appreciates the light touch. One of his friends has been pressured into taking triple science/double languages even though he doesn’t really want to because it’s what his parents want him to do. I would like to have seen the Son do triple science, but not at the cost of making him miserable doing languages he doesn’t enjoy. I want him to do well, but I don’t want him to develop resentment whilst he does it. So the die is cast. Now we wait and see. As a point of interest, my O Level choices were Art, Drama, Biology, Spanish and Computer Studies. Of those, Spanish and Computer Studies Never Happened. None of the others have been of any use whatsoever in life. How about you guys? What would you change about your academic choices of the past with the benefit of hindsight? This entry was posted in General and tagged choices, Family, life, parenting. It gets even more complicated than that. Maths is usually taken early and depending on the grade they can take a head exploding optional statistics GCSE in three months. Yes my boy is insane (he’s doing triple science). My boy takes the main body of his exams this summer. My advice from here is that you need to discuss what the boy plans to do after his GCSE. If A-levels then he needs to work out four subjects and make sure he gets a B in those. Plus of course English and Maths at C. Boys in general lose all motivation at the age of 15 so try not to get frustrated at the apparent lack of work. OK I’m frustrated as hell. The only real difference I might have made would have been taking at least one ‘practical’ subject – everything I took was, due to circumstance, largely theoretical in nature, sadly DT wasn’t an option due to the school I went to at the right time. I did do the Triple Science and Double Language option, and while I loved the science half I can confidently say that my Spanish and French have remained abysmal despite it. If there’s one thing I would recommend to fit the gaps, it’s finding the opportunity to do anything of a practical nature as a sideline hobby – woodwork, metalwork, whatever. It’s a good brain counterpoint to all the written work, and there will always be unexpected uses in later life. As an addendum to what Judith said about taking a practical subject (no idea what addendum means, it just sounded good), Don’t take anything to do with cooking or food tech. Thing is with a lot of these ‘practical’ subjects is that nowadays they are a hell of a lot more coursework based and the actual practical work is almost minimal. It’s all about writing reports, analysing things, evaluation, evaluation and guess what. Evaluation! Really check the courses you’re getting into, because it may seem alright at first, but once the coursework hits the fan your son might realise he hates it but that there’s really nothing he can do about it. That was my experience of Food Tech, and one of my best friends did something like DT and he said it was the hardest subject he ever had to do, because it was so obscure and dificult and didn’t know what it wanted to be. Oh, and GCSEs don’t mean anything, they’re just a way of getting into college. Once you’re at college, the world is your oyster. When I think back on it now, I’m so glad I’m at college and I don’t have to endure the second-rate teaching, overcrowded, mixed-sets environment of school. The dort got 2 A* and 2 A grade A’levels and is studying for a BTec in Dance. She’s never been happier or more motivated, and she can go back and do that English degree when she’s 30… or not. The Son – small no longer allowed – will do what he needs to do, I have no doubt. It’s too easy to say ‘I wish…’ and ‘If only…’ In the end I hope to regret the things I DID do and not the things I DIDN’T do! I suspect that triple science probably isn’t going to figure much in the long run. I regret taking Geography over history. It came down to a choice between the two for my Options. The history teacher was a walkover and we never did *any* work, whereas Geography was taught by a man (and then woman – two different people!) that didn’t take crap from the kids and got on with teaching. I love history but I knew being able to work in those lessons would be a nightmare and nigh on impossible. Religious studies is also something I wish I’d taken more seriously. It was one of those lessons taught in the most general of ways until you took your Options, by which time all interest in the subject had been destroyed. My oldest son, however (you’ve met him at a Games Day a few years ago – he was the quiet one!) will turn 15 in July of this year. I’m amazed at the ease he’s dealt with his schooling because I always had to work at it. When he’s not painting his Orks he can usually be found in the kitchen, making desserts, cakes and pastries. The strangest thing for me about my own choices is that I had to do French as a compulsory language at GCSE level. I had no particular interest in French beyond thinking it was cool I could (for the most part) understand a foreign language that wasn’t based on Star Trek. The strange part is that immediately upon taking my last French exam and swearing I would never speak French again, a friend of mine showed me an Eddie Izzard sketch in which he spoke French. So we made up our own jokes – in French!